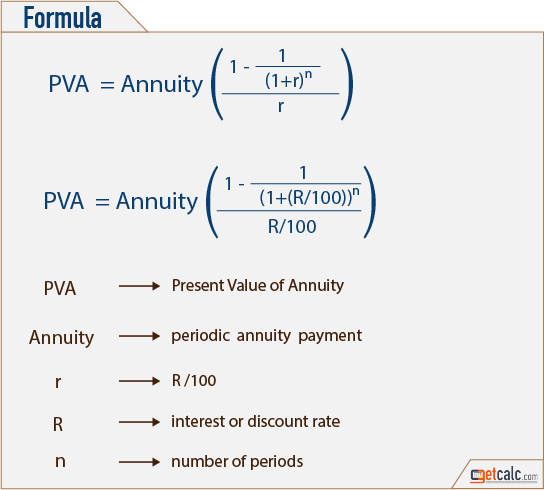 getcalc.com's Present Value of Annuity (PVA) Calculator is an online finance tool to calculate the present value of future payments after certain period of time, generally after retirement, for a long period of time or for rest of lifetime in the finance industry. Present Value of Annuity is a finance function or method used in the context of time value of money calculation, often abbreviated as PVA, represents the current value of set of cash flows in the future at a given date calculated from the discounted rate of future cash flows. The higher discounted rate reduces the present value of an annuity and vice versa in the finance industry.